Clarice Beckett was born in Casterton (Vic.) and educated at Queens College, Ballarat, where she boarded until 1903, completing her schooling at Melbourne Church of England Girls Grammar School. Her first art tuition was in charcoal drawing with Eva Hopkins of Ballarat. 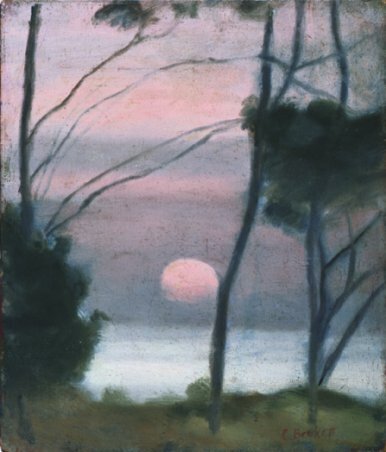 In about 1914 she took drawing classes under Louis McCubbin at Melbourne's National Gallery School, but then chose to study under the exciting and impressive Max Meldrum who had recently returned to Melbourne from Paris. During her year with him, Clarice totally embraced his theory of art as optical truth based on tonal relationships and for the rest of her life regarded herself as a realist and remained loyal to his teaching, if not his practice. Meldrum stated to several contemporaries that he found her work unique. In 1918, Clarice's father, Joseph, moved to the Melbourne bayside suburb of Beaumaris with his wife, elder daughter, Hilda, and Clarice; here she spent the rest of her life. With demanding, ill parents, she dutifully cared for the home; thus her painting time was limited. Her studio was the kitchen table; consequently most of her work was executed out of doors in the early mornings and evenings when she would wander the cliffs and shoreline with a home-made cart which held her easel and painting equipment. She took her subject matter from what she found around her and could turn a strip of wet tar-sealed road with equally unpicturesque telegraph poles into a pictorial poem, evocative of some eternal yet always elusive truth. Her subjects encompassed delicately restrained sunsets and grey, misty days with a tram or T-model Ford, lights glowing in the fog. She was a master of the early motor car, yet these appeared in her paintings only because they came rattling into sight at the moment she was truthfully depicting what she saw. She worked swiftly and compulsively, never reworking a painting. She worked for the sheer joy of it and rarely signed her canvases. Clarice usually exhibited with the Meldrum circle of painters. She had her first solo exhibition at the Athanaeum in 1923, and showed there annually until 1934. 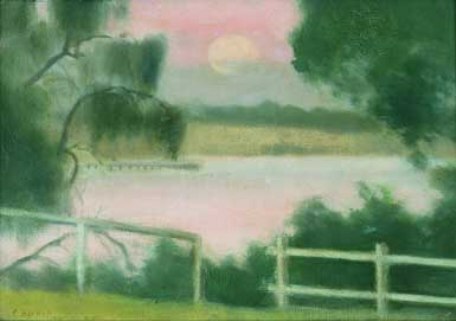 She also participated in Twenty Melbourne Painters and Women's Art Club shows until the early 1930s. Her work usually received hostile reviews (especially from J.S. MacDonald and Blamire Young) and very few of her paintings sold in her lifetime. All who knew her, however, admired her ability to paint and had a deep affection and sympathy with her role in her home life. She had a passionate love of theatre, ballet, classical piano, poetry and prose. She treasured her collection of murder mysteries and macabre stories, along with Greek tragedies and novels by Tolstoy, Arthur Machen and Algernon Blackwood. Clarice later took a few classes with Justus Jorgensen to develop her still-life painting techniques, joining his group of students at the annual San Remo summer camps. These appear to have been the happiest times of her life, where she could paint from early morning until dark. During her last years she began to use more colour in her work to reinforce form and developed a daring release of design and a modernity of style that holds its own with many later artists. In 1934 her mother died of a stroke. Clarice, already exhausted from nursing both parents, became very frail. Still painting with fervour in all weathers on whatever fragments of board or material available, she became even more withdrawn. In 1935 she was admitted to a private hospital in Sandringham, where she died from the effects of double pneumonia. A memorial exhibition was held at the Athenaeum Gallery in Collins Street in May 1936. In 1971-72 two major exhibitions were mounted at the Rosalind Humphries Galleries, Melbourne, to wide acclaim. The area around Ricketts Point, Beaumaris on Port Phillip Bay, and the soft hazy grey light of Melbourne winters are synonymous with Clarice Beckett. She worked consistently around this area capturing the essence of each place in changing light and weather conditions. Her remarkable command of the brush and eye, as well as her understanding of the immense and delicate tonal palette of the landscape enabled her, while painting en plein air, to capture the most elusive elements in nature with a rare poetic sensibility.